If your wondering – should I hire a public adjuster? – The Answer is yes! If you have a property insurance claim you should at a minimum, speak with a public adjuster about your claim. Similar to the reasons you would never even think of having the IRS to prepare your tax return, you shouldn’t solely rely on the insurance company decide how much they are going to pay for your damages. Public Adjusters are the ONLY adjusters that will solely represent you and only you throughout the claim process to ensure that you are fully compensated for your loss. Don’t let the insurance company and their adjusters dictate the outcome of your claim! We level the playing field. Stop asking – why hire a public adjuster? Free claim consultation with a Licensed Public Adjuster today! however, that is not the case at all. Insurance policies are very complex contracts and they know that the Insurance Adjusters that work for the insurance companies know this contract inside and out, do you? We as Public Adjusters know the insurance contracts limitations, exclusions and how to avoid the inevitable pitfalls associated with handling your own claim. Public Adjusters fees are based on a small percentage of what the insurance company pays, it is mutually beneficial to ensure you are properly compensated for the loss. I would like to speak with a Public Adjuster! We are State licensed Professional Public Insurance Adjusters. Greg Roover – Public Adjuster, Appraiser & the President of Claim Concepts brings experience working on both sides of the fence. Beginning his career as a Claims Adjuster for the big insurance companies, he knows how they work, think and act. His experience working on both sides has helped an ever-increasing number of property owners achieve the claim settlement that they deserved. Our job at Claim Concepts it to help people like you. Our passion and expertise are to put an accurate dollar value on your loss and relentlessly fight to recover it from your insurance company. We don’t work for the insurance company, we work directly for you with ONLY your best interests in mind…let us fight for you! Are you still questioning why to hire a public adjuster? 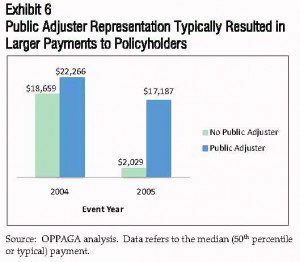 Are public adjusters worth it? Think about this, insurance companies do not make any money paying claims, actually, the claims division is most likely their largest expense and therefore the easiest place for them to increase their bottom line. You probably have enough to deal with right now. Our job includes the preparation of building damage estimates, contents inventory lists and documenting your other losses. As your public adjuster, we handle all the tedious tasks of compiling, filing and settling claims.